Trans-Phos Celebrates its 44th Anniversary! Photo from left to right: Peter McLean (Director of Safety & Compliance), Chris Whitney (President & CEO), Michael Smith (1 Million Mile Safe Driver), Captain B. Ezra Folsom (Florida Highway Patrol), Jerry Humphrey (1 Million Mile Safe Driver), Terry Young (1 Million Mile Safe Driver), Neil Whitney (Executive Vice President & COO) & Raul Polanco (Field Safety & Operations Supervisor). Three of our dedicated Trans-Phos drivers were recently recognized by the Florida Trucking Association and the Florida Highway Patrol for driving 1 million safe miles in the state of Florida. Captain B. Ezra Folsom of the Florida Highway Patrol presented letters of recognition to Trans-Phos drivers, Michael Smith, Jerry Humphrey and Terry Young. During the ceremony, Cpt. Folsom read a personalized letter from Chief Troy Thompson, Florida Highway Patrol: Office of Commercial Vehicle Enforcement in which he addressed the three drivers specifically. The ceremony took place at a Trans-Phos’ Company BBQ in honor of Driver Appreciation Week. More than 100 drivers and employees received a BBQ meal cooked by Neil Whitney, COO and served by Chris Whitney, CEO alongside all Trans-Phos leadership team members in appreciation for our drivers. Trans-Phos Named Safest Carrier in State of Florida* for Second Year in a Row! We are extremely proud to announce Trans-Phos has been recognized for the second year in a row by the Florida Trucking Association (FTA) Safety Management Council’s (SMC) as the safest carrier in the State of Florida for 2016 (bulk/other division: over 5 million miles). "We are incredibly honored and proud of this recent accomplishment," said Chris Whitney, President & CEO of Trans-Phos. "This award belongs to our entire team for their collective and relentless efforts to keep safety as our top priority." Our customers can remain confident that partnering with Trans-Phos means they are working with the safest carrier in the state of Florida. Our employees know that working at Trans-Phos means they are a part of team with the shared goal of keeping our team and communities safe. Trans-Phos is committed to delivering trusted bulk transportation with world class service and safety for years to come! Trans-Phos was recently recognized by Great West Casualty Company with the 2016 Platinum National Safety Award for "Outstanding Achievement in Highway Safety" as part of its annual National Safety Award Program. The National Safety Award program recognizes motor carriers with awards based on their preventable crash results at the end of each calendar year. Carriers are eligible to receive a Platinum, Gold, Silver, or Participatory award. Great West Casualty Company is the nation’s leading provider of property and casualty insurance for the trucking industry. With over 60 years of experience, Great West offers risk management, underwriting, claims, and loss control services exclusively to the trucking industry. Great West is headquartered in South Sioux City, Nebraska, and has offices in Meridian, Idaho; Bloomington, Indiana; Knoxville, Tennessee; and Arlington, Texas. This award truly belongs to our entire team of dedicated and safe drivers. We appreciate all our drivers do to keep our community safe on the road! Thank you, Trans-Phos Drivers! Trans-Phos is proud to celebrate its 44th Anniversary today! The company was founded on May 8, 1973 by Sam Whitney. Trans-Phos was created with the goal of providing safe and dependable trucking services to its customers. The company has continued to build upon those strong principles, growing to a fleet of more than 250 trucks and over 200 employees serving a 6-county area in Central Florida. Learn more about what we do here. Thank you to all of our incredible employees, customers, vendors and friends for contributing to the past 44 years. Here's to 44 more! Trans-Phos Celebrates an Awesome 2016 and Looks Ahead to 2017! 2016 was an incredible year at Trans-Phos! Everyone at the company contributed to another year of world-class service and safety. Trans-Phos was named the safest carrier of our size in the state of Florida and we drove approximately 15 MILLION miles! Both of these milestones were no small feat and we applaud all of our employees for their hard work and determination this past year. It truly was an awesome year and everyone on our team deserves recognition for their contribution to our success. 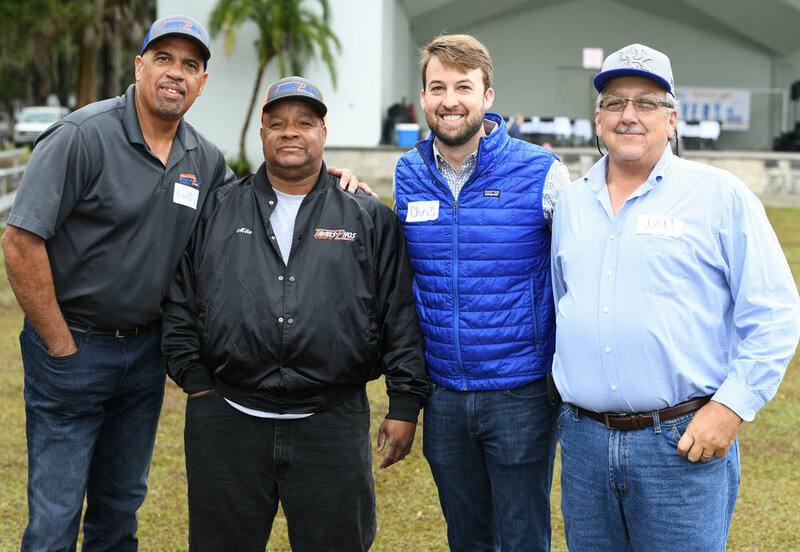 On January 7th, our employees and their families gathered together for the Trans-Phos' 2017 Kickoff BBQ. It was a rainy morning, but the weather couldn't keep us from enjoying the day. We had a delicious spread of homemade BBQ and sides (made with love by our very own Neil Whitney, John Cochran and Rick Uber), a bounce house for the kids, corn hole, snow cones and good ol' fashioned fun. We also hosted a company-wide raffle with prizes such as gift cards, Bluetooth headsets, tablets, TVs and even a Caribbean cruise for two! During the BBQ, we also recognized the Trans-Phos 2016 Drivers of the Year for their commitment to our company values and their outstanding performance in 2016. In addition, we gave out awards for our "Wheels Rollin' Program." The Wheels Rollin' Program is a peer recognition initiative (launched in 2016) whereby employees can nominate fellow team members for displaying our company values and helping to keep our wheels rollin'. Thank you to ALL of our incredible employees! Trans-Phos Receives 2016 SMC Florida Fleet Trucking Safety Award! THANK YOU to all of our drivers for keeping SAFETY as your top priority! In 1973, Sam Whitney created a novel way to advertise his startup trucking company that hauled phosphate out of west-central Florida mines. Whitney saw an unmet need, particularly in phosphate-heavy Polk County, to drive the materials the last 10 miles or so to plants — a route area rail lines didn’t handle well. Whitney got in his truck, with the name of the company, Trans-Phos, plastered on the side. He drove up and down the road with all the phosphate plants, more than a dozen possible customers. Whitney did that all day, every day, until the name sank in, says Neil Whitney, a grandson. Eventually mining companies began to hire Trans-Phos. “He was a real character,” says Neil Whitney. The core challenge, now, is on Neil Whitney, 35, and Chris Whitney, 32, another grandson. The younger Whitneys, first cousins, became the third generation to take ownership of the firm in February. Their mission is to accelerate the growth of the company, through tasks such as going from paper to computers and updating the website, while maintaining the folksy customer-oriented culture that built it. Making matters trickier: The third generation transition of a family-run business, according to several studies, trips up many companies. A big modernization step is a new software program that connects drivers to dispatch personnel and links salespeople to accounting and other departments. It cost $200,000, and took Trans-Phos two years to find the right customized version. “There weren’t any out-of-the-box software programs that worked for us,” says Chris Whitney. Chris and Neil Whitney, an executive vice president and the COO, say the hardest succession-centric challenge for many employees is simply that things are different. To overcome that, Neil Whitney, who oversees the fleet and facilities, among other roles, and Chris Whitney had multiple one-on-one conversations with employees before changes. Another big challenge for the firm, beyond succession, is one many trucking companies face: to recruit and retain top drivers. Trans-Phos recently updated its referral bonus program to compete better there. *Read the full article on the Business Observer website here. We are proud to have Chris as a member of the Trans-Phos family and congratulate him on this significant achievement and distinction as a million mile driver.